The 2018 edition of Tearstock, an annual teardrop and small trailer rally, was the most highly attended Tearstock to date, according to organizers with Liberty Outdoors. Upwards of 275 attendees and 150 trailers converged on Mackinaw Mill Creek Camping in Mackinaw City, Michigan. The four day event attracted teardroppers from not only the Midwest, but as far as New Jersey and Texas. Thursday night was an indication of how well the attendance was, with some not showing up until Friday. The Duke’s Dogs food truck on hand reported 243 people served, with those not eating could be found sampling various beers and wines provided from various locations by the attendees. Little Guy dealer General RV provided everyone with their choice of brats and hotdogs for the night, as well as having a Little Guy Max and Mini Max on hand to look over. Friday morning kicked off what was supposed to have been a one hour Camper College, hosted by Girl Camper podcaster Janine Petite and Liberty Outdoors’ Chris Baum. However, thanks to an engaging group of at least 50 attendees, the seminar lasted two hours, and in all likelihood could’ve lasted another hour. The two spoke on not only some features of the Little Guy line of trailers, but also some general RV basics that everyone should know. While Tearstock was hosted by Liberty Outdoors, which is the parent company of Little Guy Trailers, ParkLiner Trailers, and Serro Scotty Trailers, the event was open to any and all. 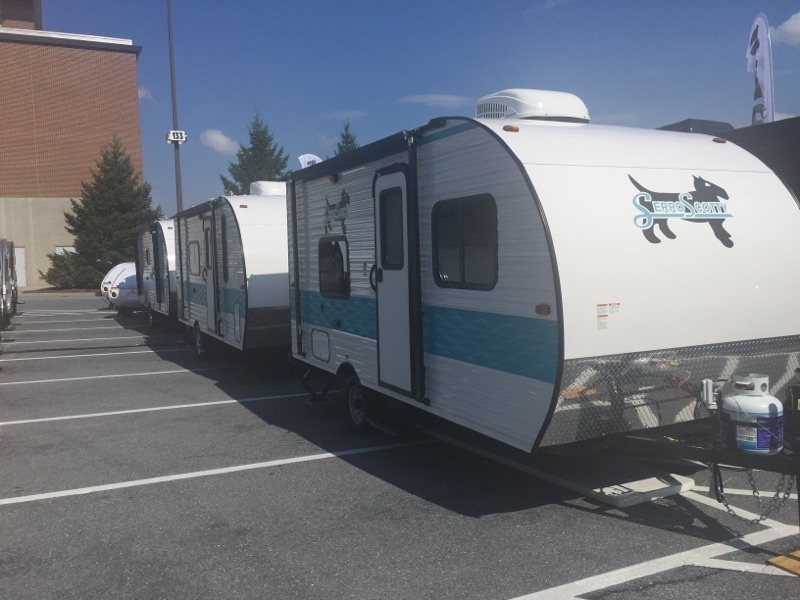 While there were the expected Little Guy, T@B, and T@G trailers on hand, there were several other brands attending, including Vistabule teardrops, Scamps, and an assortment of other odds & ends. As for the location, you could not have asked for a more picturesque setting than Mackinaw Mill Creek Camping. Many of their campsites have a great view of Lake Huron, the Mackinac Bridge, and Mackinac Island. I found that many of those who didn’t have a lake view simply brought a chair down to sit along the banks of their one mile of shoreline. What was really enjoyable for this rally was there was not a lot scheduled in terms of things that were going on to keep you at the campground throughout the day. I talked to Chris Baum about this and he told me that was done on purpose. Mackinaw City is the quintessential tourist destination, and the Tearstock organizers wanted the attendees to get out and explore the area. And that went over very well. Whether it was taking a trip to Mackinac Island, crossing the Mackinac Bridge, or visiting a quirky tourist trap like the Mystery Spot, there was plenty to do. And the cuisine is pretty darned good too…I highly recommend the Mackinaw Pastie & Cookie Company and the Bridgeview Diner. Liberty Outdoors will have a tough time coming up with a location for Tearstock 2019 (rumored to be somewhere in the Southwest) that will beat Mackinaw City. Then again, I’m a little biased as this has been one of our favorite destinations for many years. A big thanks to everyone at Liberty Outdoors for the great hospitality at Tearstock 2018! 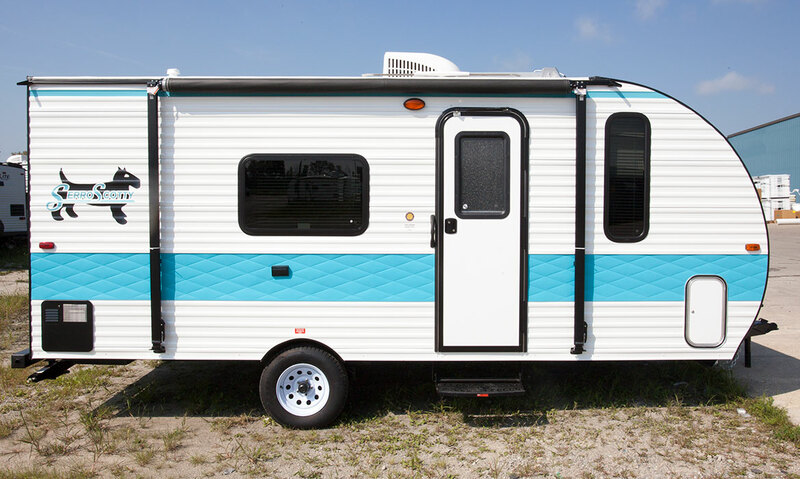 Beginning Wednesday, September 14 through Sunday, September 18, the annual Hershey Pennsylvania RV Show will feature the first look of the resurrected Serro Scotty family of travel trailers from Little Guy Worldwide. Today I got the lowdown and first pictures from Little Guy VP of Operations Dylan DeHoff. As well as the introduction at Hershey, Little Guy is also updating the Serro Scotty website to reflect the new models as well as introducing the new Little Guy logo. There are some five floorplans available ranging in lengths from 17’2 up to 22’7″, including basic couples floorplans as well as bunkhouse floorplans for smaller families. 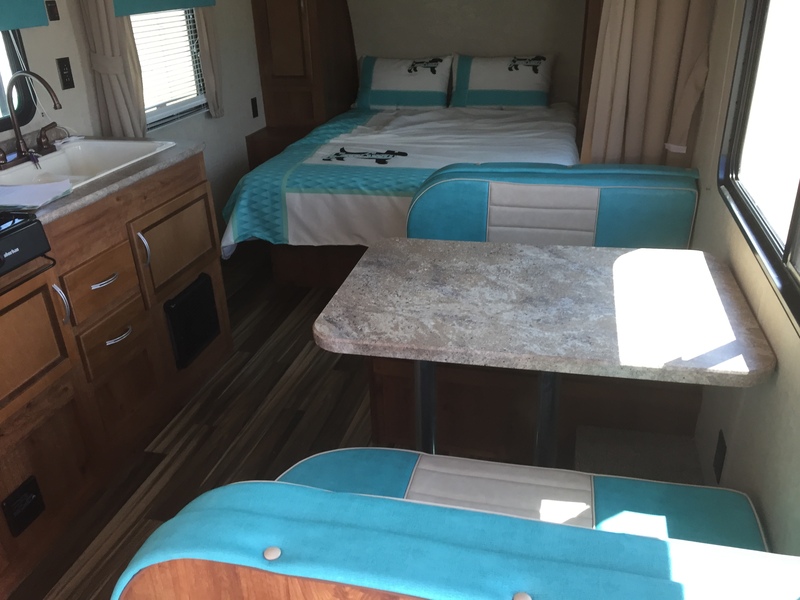 The interiors mix in the modern with the classic Scotty turquoise. Dry weights will run from 2230 lbs to 3927 lbs. Additional specs can be found on the Serro Scotty Trailers website here. But Dylan wanted to make it clear that this first wave of Serro Scotty is just the beginning. “We are also featuring a graphic on the home page of the website which shows a cropped version of our first model with two silhouette images of what models are to come. I wanted to put that on there to give the customers an idea of what is to come. 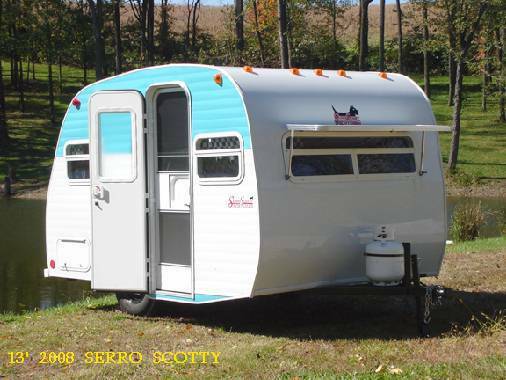 But we are really excited to offer this first Scotty as an entry level camper. We want to get the Scotty into as many people’s hands as we can so they can enjoy camping with their family. 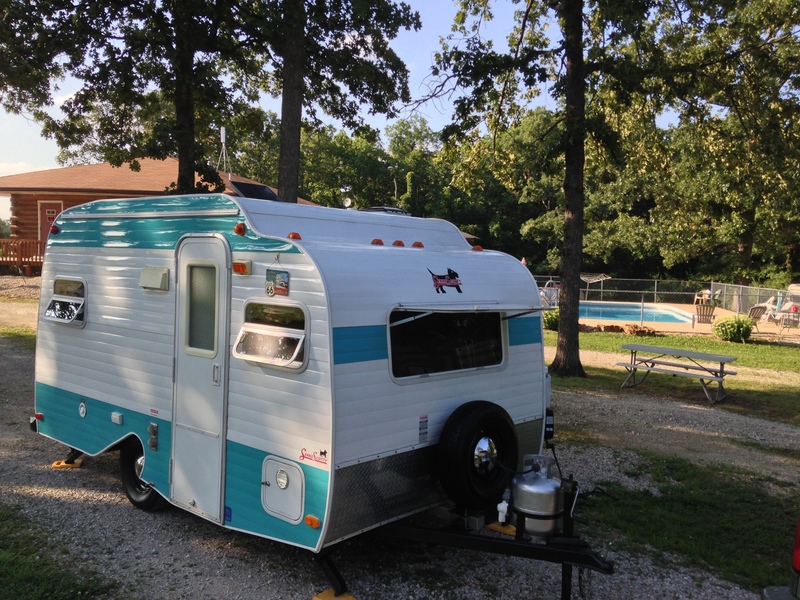 It was referred to back in the day as the “every man’s camper” and that is our goal with this first model line. Every man’s camper in terms of affordability but unique enough that you stand out from the crowd”. You can expect the 2nd wave of Scotties to be like those of the traditional HiLander (My old 2010 pictured) as well as the Sportsman. Note, these are models from previous Scotty manufacturers. I’m only offering these for reference sake. The entry level Scotties will be available sometime this year, and you can look for the more retro HiLander and Sportsman styles sometime by mid-2017. As for MSRP, the five initial floorplans will have a respectable MSRP ranging from $15,000 up to around $20,000. When comparing to other brands with similar floorplans, the prices for the Scotties will be right in line with some of the name brands out there. And considering the throwback color scheme the Scotties will wear, in this era of everything “retro”, I can easily see the Scotty as the choice for many. I’ll continue to keep tabs on the Scotty through the rest of the year and into 2017 as the new models come out. Stay tuned…this is a fun time for this segment of the RV industry.